For center hung mounting of 4" and 6" EZ Tray (use with THRD1-4 threaded rod). From ceiling hung wiring tray installations in a communications closet to a trapeze hung wiring tray installation in a factory, Cablofil® has the right hanging accessory for you. Each hanging accessory is specifically designed to work with Cablofil®'s wire hanging tray and can utilize Cablofil®'s patented FAS system for fast tray attachment without need for additional hardware. 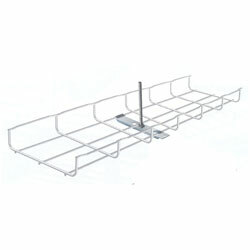 FAS - Center rod hangers used with 8" to 24" cable trays. FASP - Support bracket used for trapeze hung installations, or on walls, floors, and cabinets. Note: - Available in 8 different sizes: 8", 12", 16", 20", 22", 24", 28", 40"
Use with tray widths up to 12"